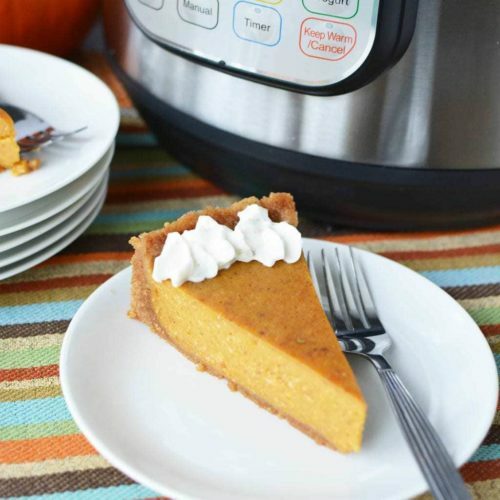 When your other family members are asking who wants to make the pies this year, you’ll gladly raise your hand knowing that you have this Instant Pot Pumpkin Pie is an easy pie recipe perfect for the holidays. Is there anything that the Instant Pot can’t make? 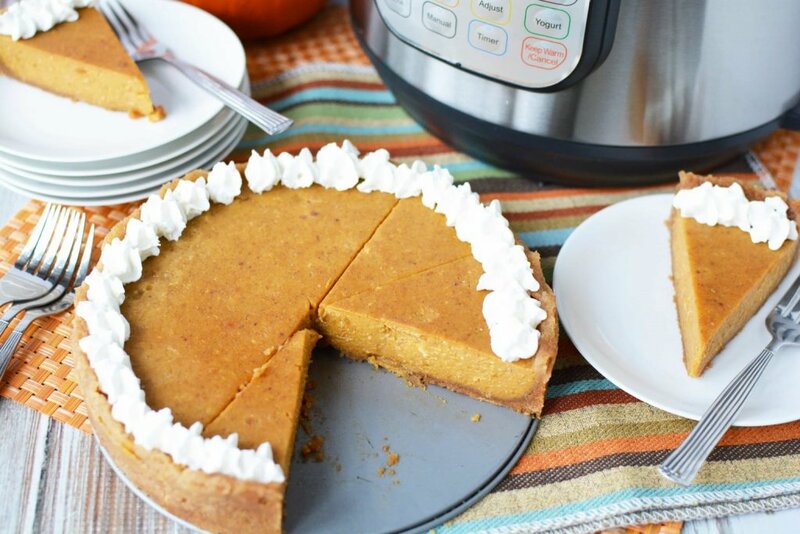 Once I found out that I could create our holiday pumpkin pie in the Instant Pot, it was game on. Think about all the upcoming holidays coming up where pumpkin pie is a big deal. Thanksgiving and Christmas for certain, right? 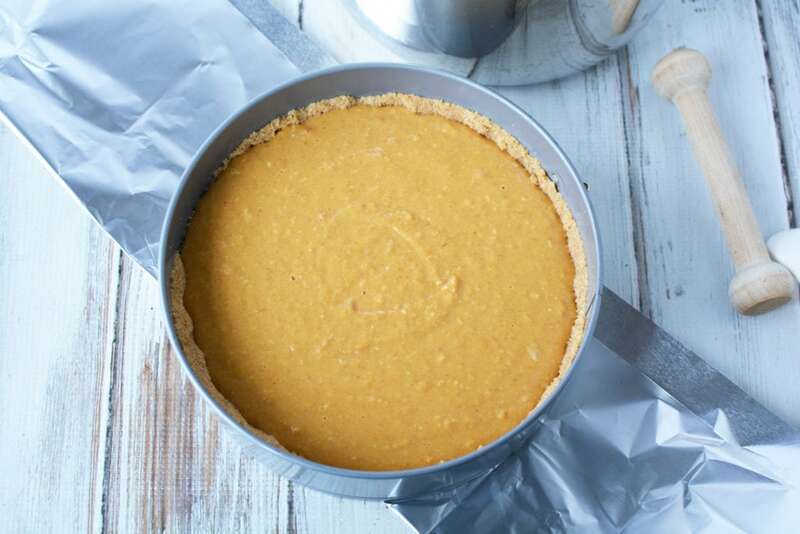 What if I told you that this Instant Pot Pumpkin Pie recipe would be a game changer for all your future holiday pie-making responsibilities? It’s simple, it’s delicious, and it takes hardly any time at all to make (the Instant Pot does all the hard work for you!). Plus, you can whip it up in a jiffy with little to no real planning. With how crazy the holidays get, I count any easy recipe as a total win! 1. 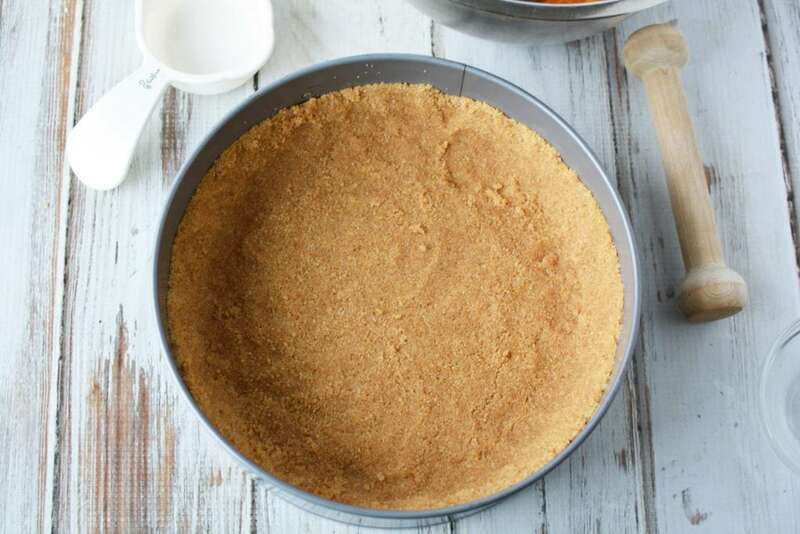 Using a food processor, finely crush graham cracker crumbs. Add sugar and butter and process for 10 seconds until combined well. 2. Spoon into n 8″ springform pan and gently press into the bottom of the pan and up the sides. Set aside. 3. In a large mixing bowl, add pumpkin puree, evaporated milk, egg, and sugar. Mix well. Stir in flour, vanilla, spice, and salt. Mix well. Pour into prepared crust. 4. Place 1 cup of water into the instant pot with the trivet. 5. Fold a long piece of foil in half and set it under the pan, bring up the loose sides and carefully place it into the instant pot. Tuck in the sides of the sling. 6. Place the lid on the instant pot and seal shut. Close the pressure release valve. Set the instant pot to manual, high pressure for 45 minutes. When the cooking cycle is complete, let naturally release for 15 minutes. Open the pot and carefully remove the sling and pie. Let cool before serving topped with whipped topping. 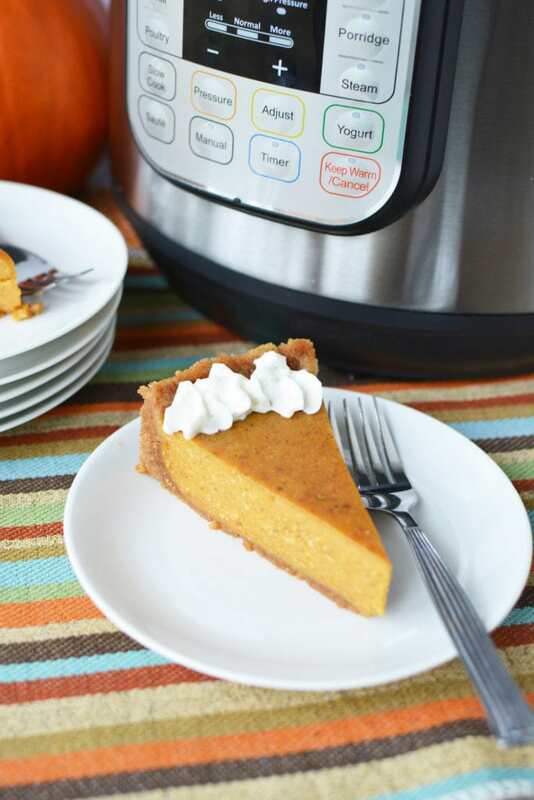 When your other family members are asking who wants to make the pies this year, you'll gladly raise your hand knowing that you have this Instant Pot Pumpkin Pie is an easy pie recipe perfect for the holidays. 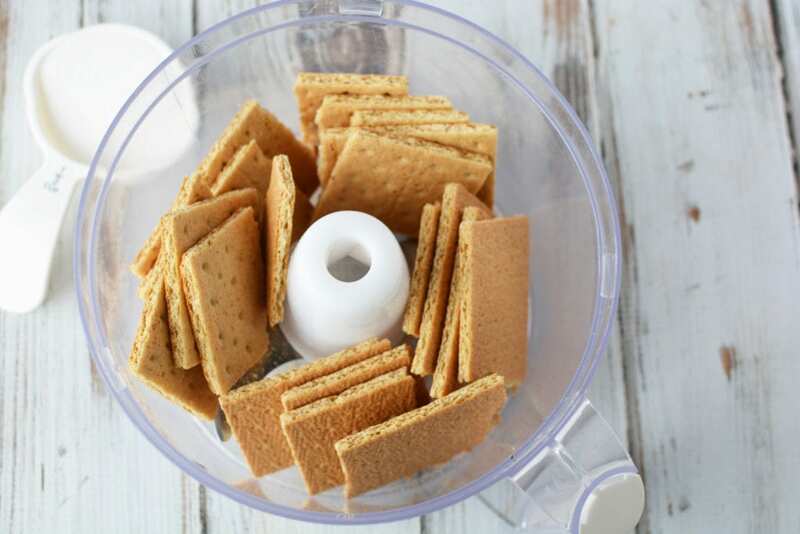 Using a food processor, finely crush graham cracker crumbs. Add sugar and butter and process for 10 seconds until combined well. Spoon into n 8" springform pan and gently press into the bottom of the pan and up the sides. Set aside. 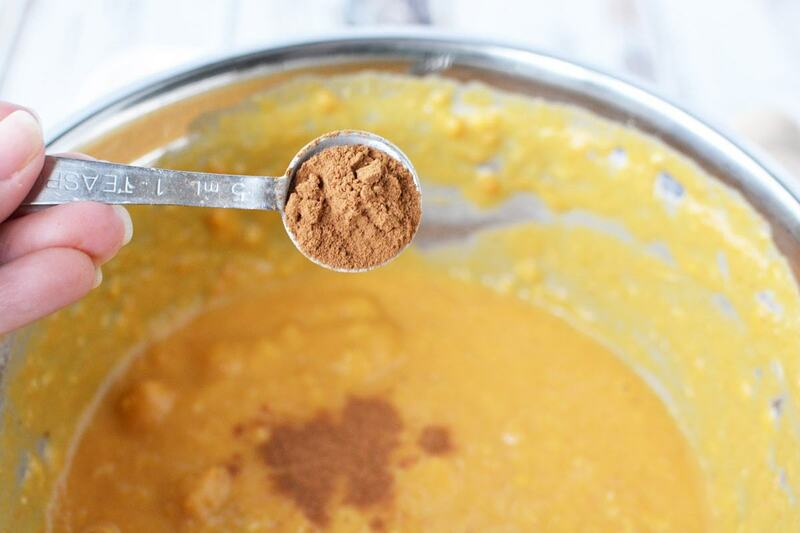 In a large mixing bowl, add pumpkin puree, evaporated milk, egg, and sugar. Mix well. Stir in flour, vanilla, spice, and salt. Mix well. Pour into prepared crust. Place 1 cup of water into the instant pot with the trivet. Fold a long piece of foil in half and set it under the pan, bring up the loose sides and carefully place it into the instant pot. Tuck in the sides of the sling. Place the lid on the instant pot and seal shut. Close the pressure release valve. Set the instant pot to manual, high pressure for 45 minutes. When the cooking cycle is complete, let naturally release for 15 minutes. Open the pot and carefully remove the sling and pie. Let cool before serving topped with whipped topping.